An Italian artist who painted elaborate religious pieces, but of which little documented information exists He was most likely associated to the Ferrarese School of Painting. His works are on display at several museums. 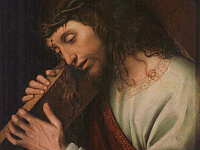 This is includes a piece titled, Christ Carrying the Cross in the Uffizi Gallery and another very similar composition by the same title in the Hermitage Museum in Saint Petersburg. There is also his Virgin and Child Enthroned with Saints in the Fitzwilliam Museum in Cambridge. In the National Gallery of London is a piece Maineri began, Virgin and Child Enthroned between Soldier Saint and Saint John the Baptist, which was completed by another Ferrarese artist, Lorenzo Costa (1460 – 1535). In the Art Institute of Chicago is his piece, Sacrificial Scene and in the Museo Poldi Pezzoli in Milian is his piece, The Flagellation of Christ. Most of these works were complete by Maineri in Ferrara.